Since Travolta doesn’t do many action movies, we liked to think of this as a sequel to Chains of Gold. Maybe “I Am Scott Barnes” doesn’t have quite the same ring to it, but it didn’t stop us from imagining what Barnes’s life might be like 25 years later. We were happy with what we saw – I Am Wrath might not be the most original movie to come down the pike, but who really cares? As long as the filmmakers stick to what works in the revenge movie format, there are no problems. Thankfully, here they do. What could have been a disaster is in actuality a crowd-pleasing winner that delivers the goods. 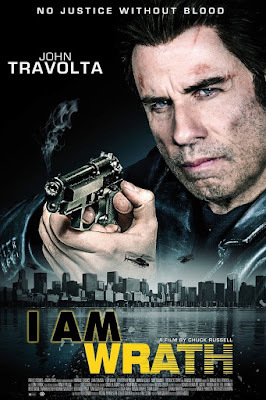 You truly get Travolta (and Meloni) unleashed, and as such the kill count is much higher than Scott Barnes ever dared to go for. Besides our beloved revenge movies, another thing we always love seeing is older heroes laying the smacketh down on young punks. 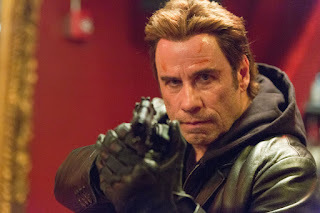 It truly was a joy watching the 62-year-old Travolta shooting, stabbing, and beating up the young whippersnappers. Director Russell, last heard from on the site when we reviewed his Eraser (1996), clearly learned from his time working with Schwarzenegger – keep the pace snappy, and make sure you have a charismatic lead hero. That’s what separates Travolta from someone like a Seagal, who has appeared in similar projects as this one. Travolta has charisma. As does Christopher Meloni (AKA Stabler), so when they’re together, sparks really fly. And there’s no stupid, annoying bickering or some sassy little kid to get in the way of all the awesome revenge action. It’s really a winner all around. If this movie had come out anytime between, say 1996 and 2004, it would have gone to theaters. But because Hollywood exclusively makes superhero movies now, everything non-spandex-related gets bumped down to On Demand, Netflix, or Redbox. That’s no longer a stigma. Of course, we’ve been celebrating DTV movies since day one, so it’s never been a stigma for us. But, generally speaking, just because DeNiro or Travolta, or anyone else, ends up on some streaming service doesn’t mean their career is floundering like it used to mean in the past. It just means Hollywood has no time for them anymore because they’re preoccupied with the capes-and-tights brigade. I Am Wrath shows you can make small, quality product that comes directly into your home and still has A-list talent involved. This appears to be the future of entertainment, so let’s all prepare for that. Finally, it should be noted that Dennis’s hideout and front is a barbershop. This of all things probably presented a dilemma for Stanley (or should we say Travolta), seeing as his hair is not real. So he gets a shave instead. How convenient. It’s unlikely Dennis could have lifted the wig off, then placed it back on and then called that a haircut. Travolta should have done like he did in From Paris With Love (2010), and gotten rid of the hairpiece altogether. It might have added to the overall grit of the movie. In the end, I Am Wrath is well worth seeing and should really please revenge movie fans.